In the same way we insert rows, we can also insert columns with Excel. If we have forgotten to include some employee information under a new parameter in our payroll, we can do so. Using age, for example, we will have to include a new column to include this data. 1. We select the cell where we want the new column to go. 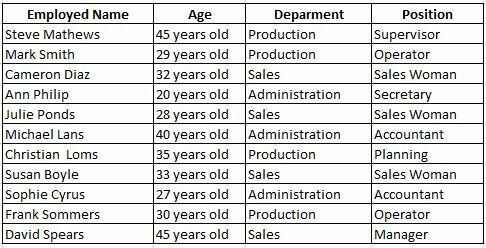 In this case, we will write Age next to the Employee Name, in other words, we select column D.
2. We find the Insert option in the Home tab of the Toolbar. 4. A new column will have been inserted in our worksheet.